Vladimir Putin’s approval rating among Americans has grown, the famous public survey center Gallup has announced. According to their recent survey, 22% of Americans have a positive attitude towards the Russian President. In 2015, only 13% of Americans felt such. Moreover, the Russian President’s popularity has grown among Republicans, only 12% of whom in 2015 had a good attitude towards the head of the Russian state. Now 32% of them do. Among independent Americans, Putin’s rating has grown from 12% to 23%. Putin’s rating has fallen only among Democrats, dropping from 15% in 2015 to 10% today. At the same time, positive views of Russia have grown a bit. If two years ago only 24% of Americans had a positive view of our country, then now 28% of Americans do. Of course, the vast majority of Americans still negatively relate to Russia and Putin. The rating has changed, but only slightly. Nevertheless, there is an increase. Where did it come from? It seems like Americans are facing the paradoxical effect of their own propaganda. Over the past year, leading American media have “proven” to voters that Russia is to blame for everything. European media are not far behind them. During the campaign leading up to the referendum on Britain exiting the EU, English newspapers were flooded with articles in the likes of “Putin would love Brexit.” Such statements were obviously used to scare British voters into voting for continued EU membership. The end result, however, was the opposite. The British voted in favor of exiting the EU. It immediately turned out that an influential part of the island’s elite had been for rejecting unified Europe, while yellow newspapers wrote that even the Queen herself had spoken in favor of Brexit, but there were no confirmations of this. But mass sentiment was clear in lower ranking publications: “let the Prime Minister be against us and the Queen secretly for us. In the end, according to British propaganda, none other than Putin and Russia secured Britain’s withdrawal from the EU. The Americans picked up the British baton. During the US elections, Donald Trump was accuse of having secret ties with Russia. It came to the point that Hillary Clinton officially, during debates, told the future US President to his face: “You are Putin’s puppet.” Trump himself preferred to be more modest, and said that he will be known as Mr. Brexit, thus hinting at his unexpected electoral victory. And then he really did win despite the skepticism of the elites and expert communities. Yet Trump’s administration continues to be accused of having secret ties to Russia. Recently, such accusations became the reason behind the resignation of General Flynn, the president’s assistant on national security. He was charged with committing the terrible crime of talking with the Russian ambassador. Even though there is nothing criminal in such a conversation, the general was forced to leave his post. The search for a Russian conspiracy has now spread to Europe. The leading candidate in the French presidential elections, Macron, has asserted that Russia might interfere in the elections to be held in April. Politicians in Germany have also spoken of “Russian interference” in elections in Germany, where a key vote will take place in September 2017. The new Bundestag will be elected and the balance of forces therein will determine whether Angela Merkel will keep the office of Federal Chancellor. But let us return to the rise of Russia’s popularity in America. Let’s imagine the American voter being told that Russia is behind all events in the world. 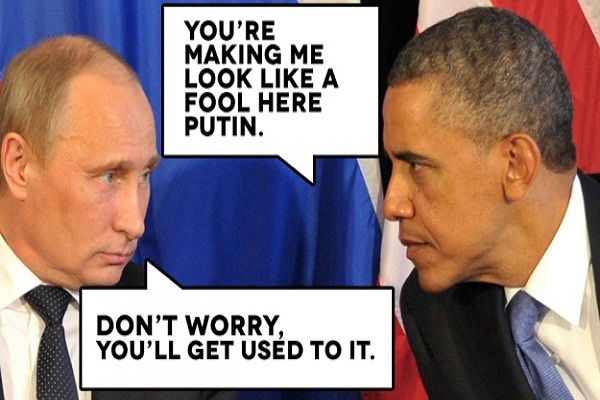 Then it is only logical that Russia and Putin must be all-powerful. After all, they’ve been purported to have achieved (1) Brexit, (2) Trump’s election, and are about to achieve (3) the victory of a pro-Russian candidate in France and (4) the ascent to power of pro-Russian forces in Germany. If we assume that this is all true (after all, the biggest European and American politicians and media insist on this), then it has to be recognized that the Russian global conspiracy is a powerful thing. If so, then some American voters will come to the conclusion that it would be good to be friends with this Russia – a country that secretly chooses your president is cool, Republicans and independents conclude. And Putin’s rating among them is rising. The Western elites have played this conspiracy so much that smeared-in-black Russia is now demonstrating growing popularity. This is no surprise. Mathematics teaches us that a minus and a minus make a plus. Over the past year, Russia has been attributed so many minuses that American voters have begun to think about whether this country which is so smeared is actually bad. Perhaps the very emergence of this thought means a serious pivot in Western public opinion. Sure, this turn is only being hinted at now, but this is only the beginning. The wrath of the “Russian world conspiracy” is gradually dissipating and Western elites are beginning to understand that they will have to answer to their constituents without citing Kremlin conspiracies. This change in public consciousness promises political changes in its wake.